Our weaving facility can incorporate many natural and synthetic yarns such as cotton, flax, polyamide, polyester and aramid. 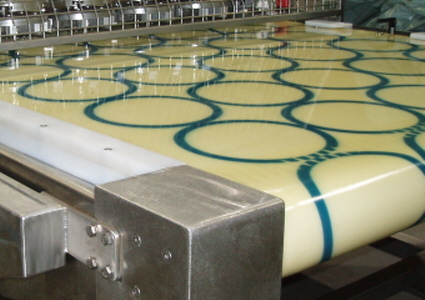 Our coating processes deliver a wide variety of covers and profiles. The result: very high quality belting worthy of your business process. The unique flexibility of our endless woven belting range is shown by the fact that extremely heavy armoured cables can be processed with the same degree of smoothness as delicate biscuit dough. 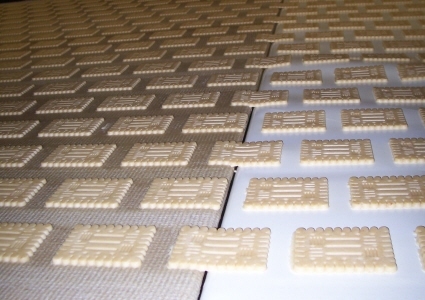 High-quality, high-performance and long-lasting biscuit extraction belts. The bottom side is impregnated with wear-resistant PU to maintain belt shape and to prevent narrowing. Unique cotton and polyamide warp yarns provide resistance and excellent product extraction properties (for any type of biscuit). The polyamide reinforced selvedges guarantee food safety. Strong flax yarns in the weft ensure lateral stability. 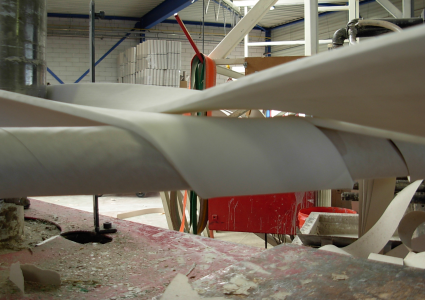 Their extended belt life and continuous absorption capacity make the AmDough Belts very cost effective. 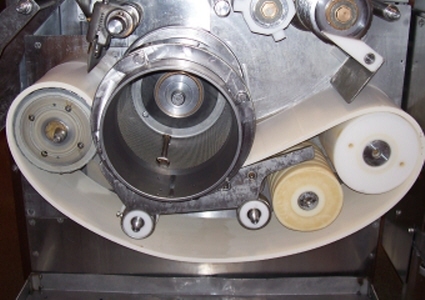 AmSqueeze soft separator belts are used in the Food Industry where products such as meat are refined or recovered. AmSqueeze soft separator belts transport product via a perforated drum and squeezes the softer material (i.e. meat) through the perforation. The harder particles (i.e. bones) remain outside the drum. 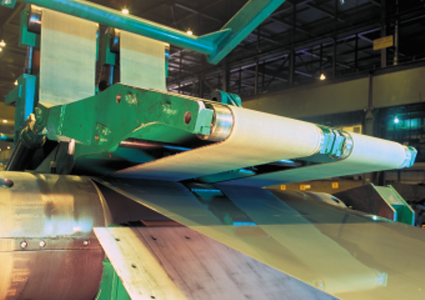 AmWrap Belts are used on coil wrapping machines in the Metal Industry (mainly steel and aluminum) to coil sheets of various thicknesses, temperatures and bendability. AmPull Belts are used in the Cable Manufacturing Industry where extruders are used to apply insulation or coating on bare cable material. AmPull Belts are able to work at high speeds and withstand considerable pressure. Available in a wide range of wear-resistant, high grip covers, smooth or with grooves on both top and bottom side. 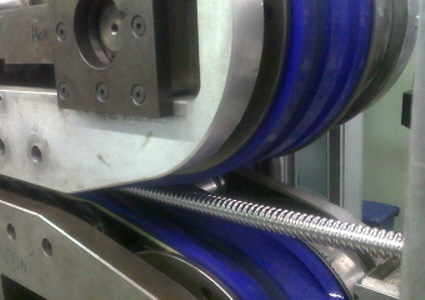 AmPull Belts are always manufactured in pairs ensuring constant cable quality. Made to wrap tightly around mandrels on spiral tube winder machines to produce cardboard paper tubes (used for toilet rolls, carpet rolls, food industry packaging, concrete forms, etc.). Our range consists of 2 series for medium (500-series) to heavy (700-series) tube winding applications. Positioning Belts are used in semi-automatic food processing lines (pizza topping lines, pastry fillers, chocolate depositors, decoration lines etc.). They can be marked to indicate the correct positioning of products for further processing. Any graphical design can be printed. The possibilities are… endless! Lesser quality belts are printed with ink directly on the top belt and are subject to the influences of food (which can lead to food contamination), scrapers and cleaning agents. Ammeraal Beltech Positioning Belts offer clear, non-fading sealed markings, resulting in a Food Safe belt.